TouchPad supports the Lenex meet results file format (file extension .LEF) for UK swim teams. It is a modified XML format. In order to successfully export the results, the following must be true. Club name must be correct. All athletes must have proper IDs. 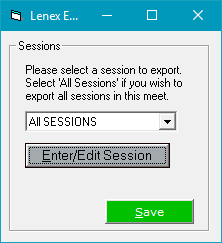 Click File > Export Lenex Meet Results. By default it will export results for all sessions. To export results for a single session, click the dropdown and select the desired session. Click Enter/Edit Session to open the Set Event Session window to view the sessions and make any needed adjustments. Click Save to begin the export and Yes to confirm. Change the save location if desired and click Save. Based on the meet size and number of results, it make take several minutes to generate the file, but most take just a few seconds. If a team name is incorrect, a dialog will appear where you will need to select the correct team name and click Save. This will repeat for all incorrect team names. Once it finishes, click OK on the final confirmation dialog. The generated file is then ready for importing. Note that it saves both a .LEF file and .ZIP file containing the .LEF file. The latter saves time when emailing. Note that it saves both a .LEF file and .ZIP file containing the .LEF file. The latter saves time when emailing.